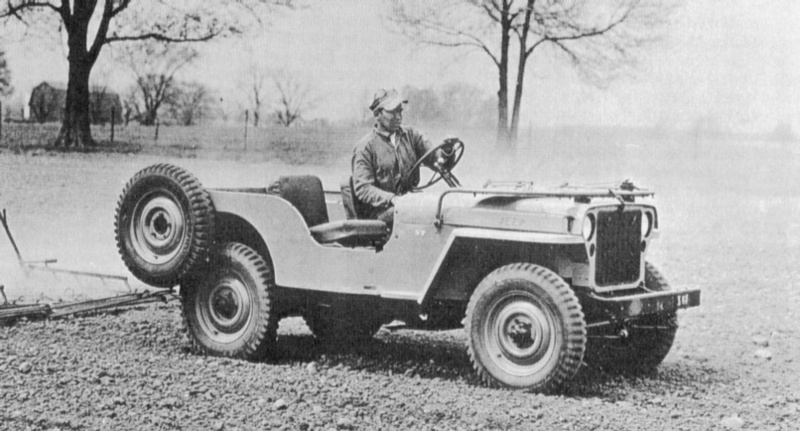 This 1945 CJ-2 Agrijeep prototype, CJ2-37, is X61. It was one of the most photogenic of the later stamped "JEEP" CJ-2s and it is shown in 4 of the 'Jeep Tomorrow' photo set that Willys-Overland gave to dealers prior to the CJ-2A production run. The previous owner, Paul Propst, was able to carefully remove the paint from the rear cross member and found the original X number! "Currently the jeep's history from 1945 until 1950 is unknown. However, by 1950, the Spangler Equipment Company, a Ford tractor dealership in Brian Ohio, had the Jeep on their lot for sale. 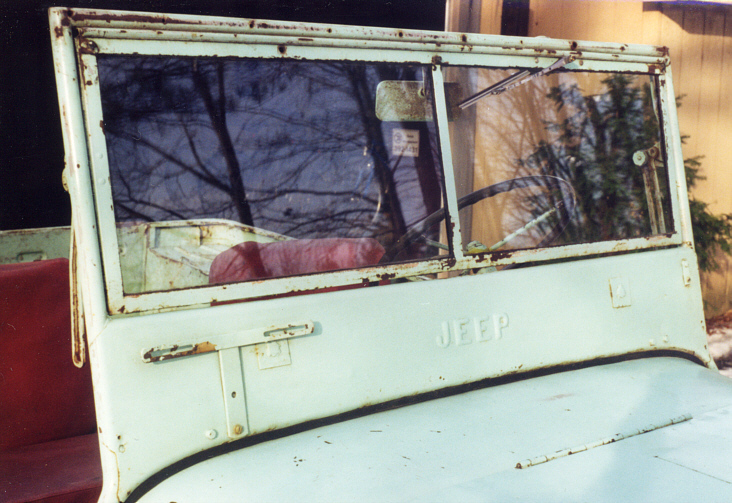 The Jeep's original Harvest Tan color had been covered by yellow paint and the wheels that started off Sunset Red (an orange color) were now painted black. A home-made aluminum half cab had been added. 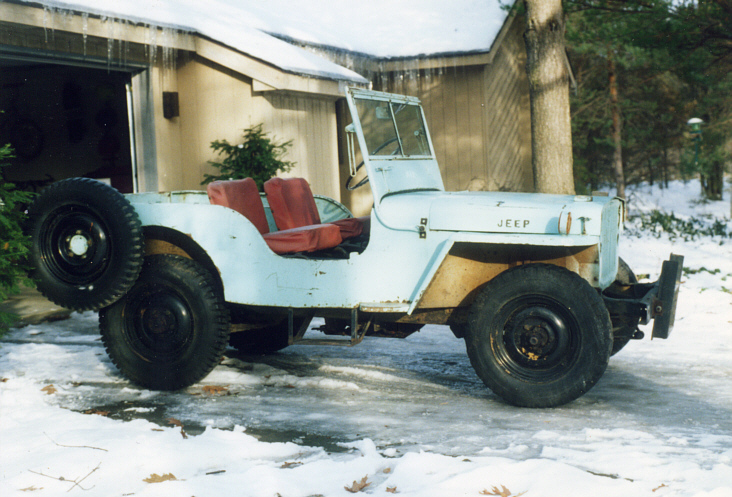 In 1950, Peter Traxler, a Montpelier, OH farmer went to Spangler and traded a pickup and some cash for the Jeep. He used it to get from his 80 acre farm to town, to pull wagons, and to do hay racking. While racking, the hay would tangle around the drive shafts and stall the jeep. 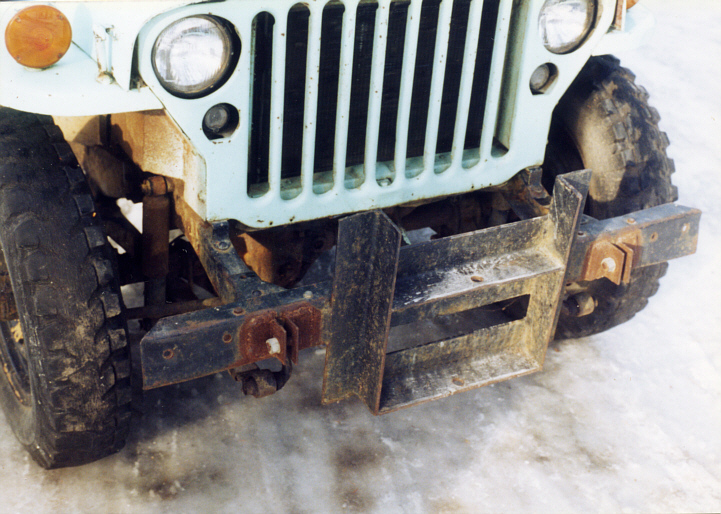 Peter clamped an aluminum sheet along the bottom of the Jeep to prevent this. 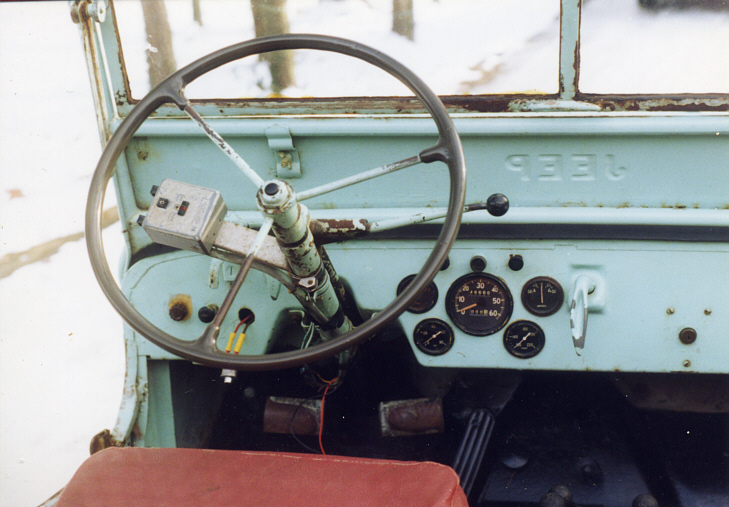 When the USSR put "Sputnik" in space, Peter painted "Sputnik" on the cab. Eventually, the aluminum cab became so weak, it was removed. Peter said he enjoyed the Jeep and liked to scare passengers by going around corners fast. At some point will "hotrodding" it, the engine overheated enough to wreck it. He replaced the engine with a short block engine he purchased through Sears. He did a few other light repairs and remembered the replacement parts were often military surplus. He recalls driving it a lot - several times during hard snow storms. Peter's sons, Tom Traxler remembers driving the when he was 13 or 14 years old. Somewhere between 1958 and 1960, Peter's brother-in-law, Robert W. King, traded a boat and some cash for the Jeep. Ken Manley, Robert's friend, did a bit of tuning and added turn signals and lights. Some body work was done including patching of holes in the foot wells, tool box and along both sides of the body. A newer WILLYS tailgate and interior mirror was added. There was now no exterior mirror. 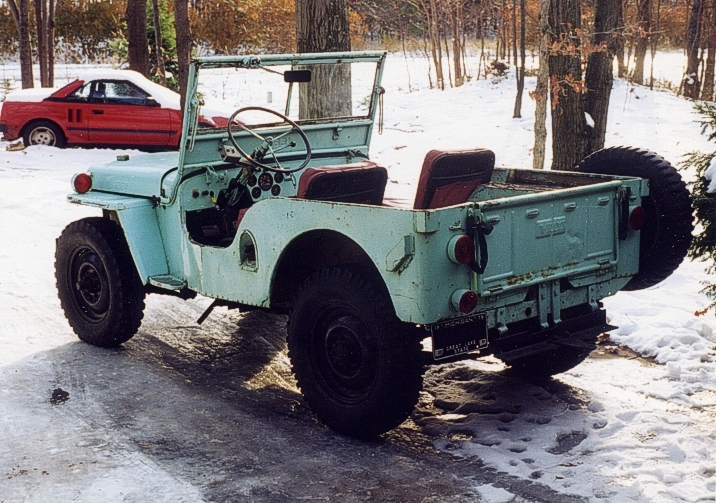 The jeep was painted its current green, but the wheels were left black. This work was done by the Miller Bodyshop in Montpelier, OH. Someone also added the red seat covers, but who did this is not know. When all this work was complete, Robert too the Jeep to his fishing cabin near Kalkaska, MI. Robert died a few years ago. In 1970, Robert sold the fishing cabin to Ken and Jeanette Manley. Ken also bought the Jeep from Robert for $50. 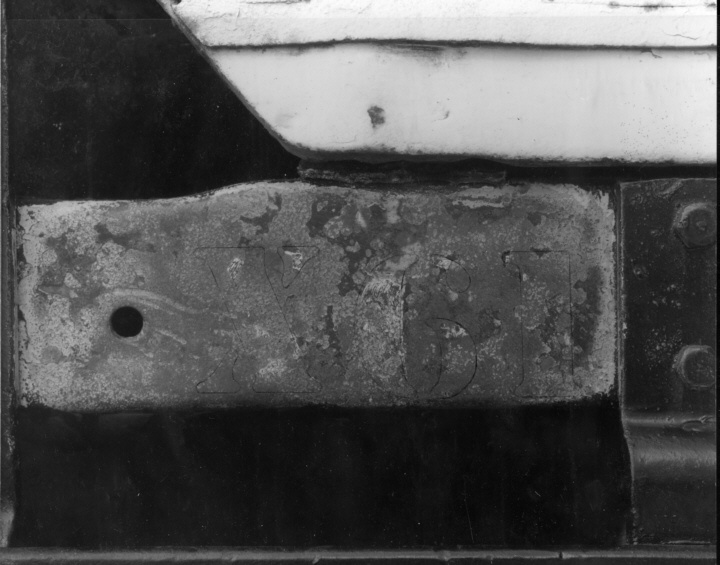 The Jeep remained at the cabin unchanged except for a simple pipe rack stuck into the top sockets to haul a canoe. It was used to get the canoe in the river and for short trips into town - never very long distances from the cabin. Ken remembers the Jeep ran well the whole time, but the engine began smoking a bit. In 1989, the Manleys sold the fishing cabin to Richard Meckley, an architect from Holland, MI. The Jeep was included in the sale as part of the property. It was always house in a shed near the cabin out of sight, and for a while, Richard did not use the Jeep. When he did finally get out the jeep, it would not start. All attempts to get it running at the cabin failed, and it sat in the shed until 1996 when Richard brought it home in Holland for a more serious attempt to get it running. A few minor things where tried involving wiring, but the Jeep remained quiet in his garage until December. An ice and snow storm in December put an end the Jeep's storage in the garage. Richard decided the Jeep needed to go. Paul Propst had met Richard in the summer and seen the Jeep. Since the Jeep's details were very different from others Paul had owned, he told Richard it might be something rather special. Richard remembered Paul's interest in the Jeep and gave him call. December 11, 1996, Paul bought the Jeep for $500 with the understanding he would move the Jeep right away in the snow storm. Paul and his two youngest sons moved the Jeep through the storm to their home in Holland Michigan." Around this same time frame, Paul started performing some research on the CJ-2s. Because I owned CJ2-12 at the time, he contacted me. I confirmed to him that it was a CJ-2 prototype. I fabricated one of the missing side top bow brackets based on some drawings I made from one of CJ2-09s. We kept in touch and in November 2005, Paul decided he wanted to sell the jeep. On January 21, 2006, I bought the jeep from Paul.